Fender American Elite Jazz Bass; an incredible bass guitar seen here in a classy and sleek black finish, offers up fantastically versatile s..
Fender American Elite Jazz Bass; an incredible bass guitar seen here in a classy and sleek black finish, offers up fantastically versatile sound that is perfectly suited to any playing style. 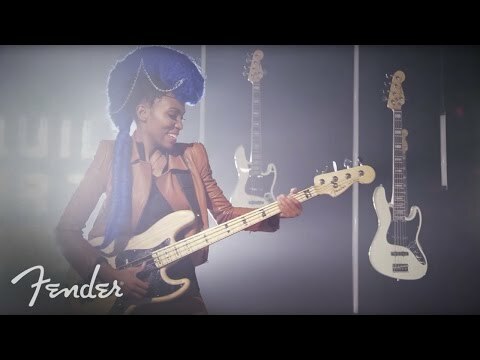 Fender have seriously packed in a heap of innovation when it came to their latest line-up of the American Elite Jazz Bass; an active bass that was designed for the modern bassist. With cutting edge technology and timeless style, the American Elite Jazz Bass delivers an incredibly fast and smooth playing feel with a versatile sound that goes with any playing style from picked and plucked to slap-and-pop. 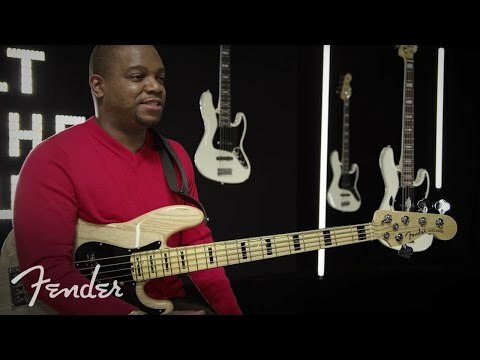 Fender have designed the American Elite Jazz Bass with the 21st century bassist firmly in mind and part of this modern player focused work is the inclusion of the all-new American Elite neck. Sporting a new compound neck profile designed for comfort and the ultimate in playability, this design goes from a modern “C”-shape at the nut while the neck’s rear gradually changes along its length, becoming a modern “D”-shaped profile towards the heel. Allowing for improved higher fret access, the elegantly styled, fantastically functional neck heel has been designed especially for the American Elite series. The cutaway neck heel blends beautifully into the asymmetrical neck volute offering an enhanced playing feel with peerless comfort. Exclusive to the American Elite Series, Fender have equipped this jazz bass guitar with all-new 4th generation noiseless pickups. Achieving the sonic equivalent of cold fusion, the authentic vintage-style Fender sound combines with noise-free performance so you get crystal clear output which is essential for studio recording and professional live performance. An incredible leap forward in technology, these 4th gen Noiseless pickups are at the apex of Fender’s pickup design giving you crispy clean clears and huge overdriven tones. Boosting your power for even greater signal quality, a newly redesigned 18-volt preamp is on board, creating chest-rattling, thumping tone and increasing headroom while reducing noise. Working together with the Noiseless pickups, this incredible new preamp allows even further versatility with your tone. Being from their American made Elite line, you know that Fender have gone all-out with this incredible bass. Right from the new truss rod adjustment wheel making neck relief adjustment a breeze, to the American Elite exclusive 4th Generation Noiseless pickups and newly designed neck profile and heel – this jazz bass is precision engineered to give you the best possible playing experience with killer tone and versatility to boot. The cherry on the sundae; each Fender American Elite Jazz Bass comes in a newly designed American Elite moulded case which features body-hugging contours providing increased protection for your bass. Nested stacking ability allows for easy storage and more secure transport while TSA latches offer increased security. Innovation, great tone and ultimate playability – the American Elite Jazz Bass has it all.